This photo was taken in my neighborhood, Hamilton Heights. Hamilton Heights is the northwestern part of Harlem. The image was made late afternoon, as I was walking home from running errands. There are always interesting people hanging out in front of the large apartment buildings along Broadway. What first drew me to her, was the fact she was holding money and there was no one else around her. As I walked by, she glanced at me. I smiled and took her picture. She didn't say a word. It was slightly overcast. I sometimes prefer this type of light, as it tends to envelope everything, wrapping around the subject. This image was made using a Ricoh GR. It is one of my favorite urban cameras. Small, light, quiet, unobtrusive, with an APSC sensor. 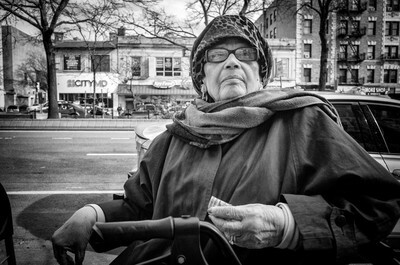 This image is part of an ongoing project entitled "Broadway". I have been documenting the people and sites along Manhattan's main thoroughfare for quite a long time. Broadway runs through many different neighborhoods. It is lined with shops, offices, and interesting people from all walks of life. I treat every image as if I am working in a darkroom. I am a bit old fashion that way. No batch processing. I use Photoshop as my darkroom and dodge and burn where necessary. I convert my digital color files in EFEX Pro. The only thing I ever have in my bag is my Ricoh GR and possibly my Olympus Pen-F with a couple of lenses for versatility. I tend to shoot intuitively. I also have projects. I tend to let my feet do the wandering and keep my eyes open for things that interest me. I always have a camera with me. I think if you are a photographer, that is the most important thing to have with you! Be open. Try to see the "other" in everything you do. Read, know history, especially photo history. Use this to extend the reach of your voice. Use your heart and your own personal vision will follow.